The TravelTalk Sim will only work with an unlocked mobile handset. We recommend that you use a 3G mobile phone and that if you have any other mobile handsets that you test before travelling. Detach the Traveltalk SIM from the SIM card holder and insert it into your mobile. Your mobile will request a PIN, which is printed on the plastic card holder below your SIM number. Enter the PIN and press OK/accept. 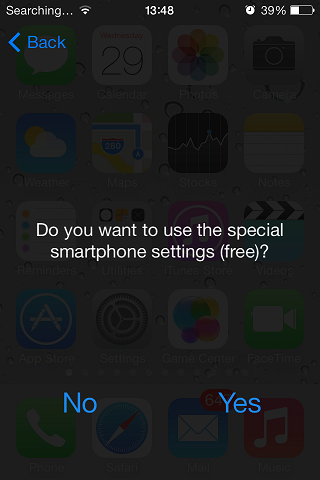 Your screen will display the message: 'Do you want to use the special Smartphone settings (free)?' If a Smartphone is used, please select 'yes'. To check your SIM set-up select 'SIM Services', 'Call-back', 'Smartphone Mode' and make sure that it is '*on'( if a Smartphone is used). Ensure that you have network coverage. The name of the mobile network and the active Traveltalk profile name should be displayed on your mobile. There are four different profile options: 'Global SIM', 'UK SIM', 'Direct SIM' or 'EU Profile'. Traveltalk will automatically activate the best profile to provide the cheapest calling service. On some phones the selected profile will not be displayed. If 'UK SIM', 'Direct SIM' or 'EU Profile' is displayed on your mobile screen, you will be notified by the following voice message - 'Please wait while we connect your call', and you will shortly be connected to the destination number. If 'Global SIM' is displayed on your mobile screen, there will be a short pause without any sound or line tone. Your mobile may also (depending on the model) display the on screen message - 'Please wait'. After a few seconds your mobile will ring. Once you press , you will be notified by the following voice message - 'Please wait while we connect your call', and you will shortly be connected to the destination number. Answer the call exactly as you normally would do. Test your SIM card within the UK to check whether it is compatible with your mobile or not. Ensure you're dialling correctly, including the international dialling code (preceding with '00' or '+'). You will need to do this even if you're calling local numbers. using 'Global SIM' profile, remember to wait for the phone to ring back after dialling the number and answer it by pressing . If the SIM is still not working, please test it from another unlocked phone. If the problem to connect persists, please dial the following sequence of numbers. This will enable our operations department to analyse your call and come up with a solution: dial 0044 208 497 9295; or if this fails, dial *126*102*00442084979295 . Please also note the time of the test call. If your SIM has worked successfully in the past, it is most likely that any problems are related to mobile, settings or network issues and not the SIM itself. Detach the Traveltalk SIM from the SIM card holder and insert it into SIM 1 slot in your mobile. Your mobile will request a PIN, which is printed on the plastic card holder below your SIM number. Enter the PIN and press OK/accept. Check your SIM set-up select 'SIM Services', 'Call-back', 'Smartphone Mode' and make sure that is is '*off'. The name of the mobile network and the active Traveltalk profile name should be displayed on your mobile. There are four different profile options: 'Global SIM', 'UK SIM', 'Direct SIM' or 'EU Profile'. Traveltalk will automatically activate the best profile to provide the cheapest calling service. You will be notified by the following voice message - 'Please wait while we connect your call', and you will shortly be connected to the destination number. If you are experiencing problems please call our Customer Service. After the initial Top-Up, you will have the option to buy additional credit on-line at www.traveltalksim.com using PayPal, Debit/Credit Card or by calling Customer Service. Automatic Top-up is a great solution if you don't want to worry about running out of credit or are travelling to a remote location with limited or no internet access. We will automatically top-up your Traveltalk SIM when your calling credit drops below £3. You can set-up Automatic Top-Up online when you register for the service or you can call Customer Service. The Top-Up option can always be changed on-line at www.traveltaksim.com or by calling Customer Service. The daily Top-Up limit is £50. The network displayed on your mobile. Precise time & date & time zone of outgoing call. Do you have problems receiving a call? What do you hear/see on the screen when attempting to make a call? Current location (country & city). Make & model of your mobile.